Mode: Popup menu, Default: TVDamage Color . 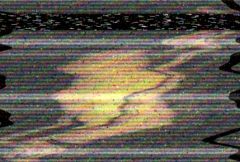 TVDamage Color: simulates a color TV. TVDamage Mono: simulates a black & white TV. Reception Master: Default: 0.4, Range: 0 or greater. Num Ghosts: Integer, Default: 5, Range: 0 to 30. Negative Ghosts: Default: 0.5, Range: 0 to 1. Spacing: Default: 0.2, Range: 0 or greater. Vary Position: Default: 0.3, Range: 0 to 1. Shift: Default: 0.5, Range: -1 to 1. Bar Roll Speed: Default: 0.5, Range: -10 to 10. The speed of the bars rolling up the screen. Turn negative for downward rolling. Bar Sharpness: Default: 0.5, Range: 0.1 to 10. Sharpens or smooths the top and bottom edges of the main bars. Set to zero for no main bars; you will only see the smaller bars. Bar Frequency: Default: 1, Range: 0.1 or greater. Bar1 Width: Default: 0.35, Range: 0 to 1. Bar2 Rel Frequency: Default: 6, Range: 1 or greater. Bar2 Sharpness: Default: 0.5, Range: 0.01 to 10. Sharpens or smooths the top and bottom edges of the smaller bars. Set to zero for no small bars; you will only see the main bars. Color Frequency: Default: 10, Range: 1 or greater. Color Angle: Default: 160, Range: any. Roll Speed: Default: 3, Range: 0 or greater. Controls how fast the stripes roll over time. Fast Forward Amount: Default: 0, Range: 0 or greater. Band Frequency: Default: 4, Range: 0 or greater. Band Shift: Default: 0.1, Range: 0 or greater. Band Height: Default: 0.16, Range: 0 to 1. Tape Dropout Brightness: Default: 0, Range: 0 or greater. Dropout Length: Default: 0.25, Range: 0 to 1. Dropout Gap Length: Default: 0.2, Range: 0 to 2. The average length of the gaps between the dropouts. Dropout Y Freq: Default: 5, Range: 0 to 50. The dropouts appear on random scanlines according to a noise function with this frequency. Decrease to get a few large bands of dropouts; increase to get lots of small bands of dropouts. Dropout Y Threshold: Default: 0.75, Range: 0 to 1. Dropouts Always: Default: 1, Range: 0 to 1. Scanlines: Default: 0.1, Range: 0 or greater. Scanlines Rel Freq: Default: 1, Range: 0 or greater. Orthicon: Default: 0, Range: 0 or greater. Turn Off: Default: 0, Range: 0 to 1. Flare Width: Default: 1, Range: 0 or greater. Flare Brightness: Default: 2, Range: 0 or greater. Fade Out Time: Default: 0.3, Range: 0 to 1. Fish Eye: Default: 0, Range: any.